I’ve been a total tease about today’s project because I’ve been dancing that line of oh-my-gosh-I-need-to-share-this-immediately and darn-I-should-save-this-for-Trash-to-Treasure-Tuesday. It’s been sneak peeks galore on my Instagram Stories with this thing. Sooo… guess what day it is?! Trash to Treasure Tuesday, baby. 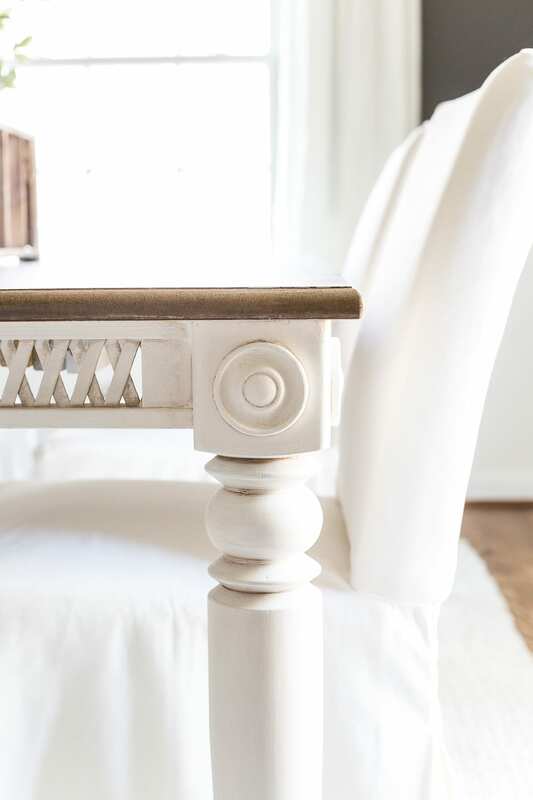 It had a lot of knicks and scrapes and the paint was turning kind of yellowish, but oh my gracious alive those carved details had my heart from the start! It took three solid days to finish this table, but it was worth every minute of it. 1. I sanded down the entire tabletop first with the belt sander, starting with the coarse grit until all of the paint was removed and then evening out the finish with the medium grit, and finally the fine grit to smooth the bare wood. Basically, it’s a confetti party of sawdust. 3. 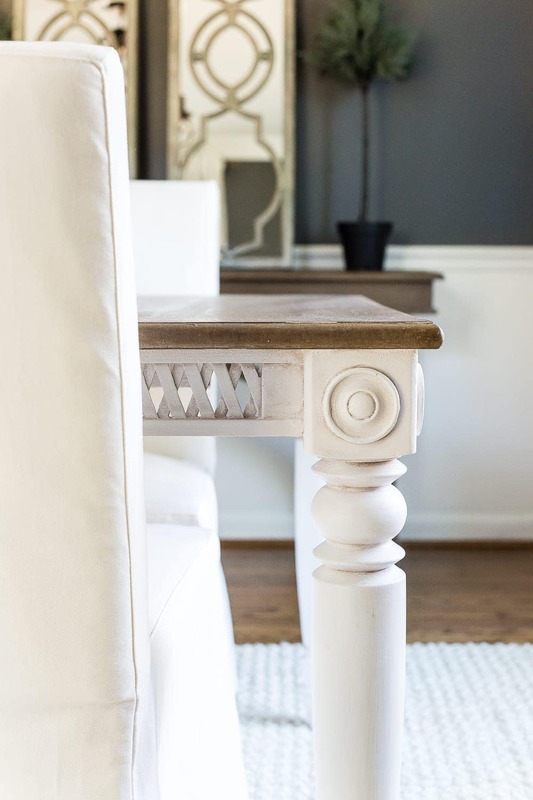 Wipe down the entire table with a tack cloth to get rid of any remaining sanding dust. 4. 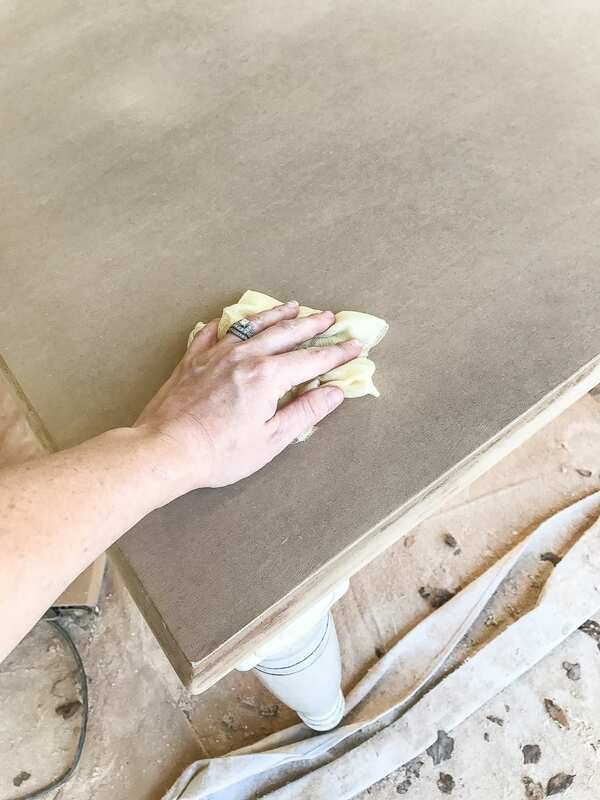 When the tabletop was completely smooth and free of paint, I used a foam brush to apply a coat of the Minwax Wood Conditioner so the stain would take to the wood more evenly. 5. 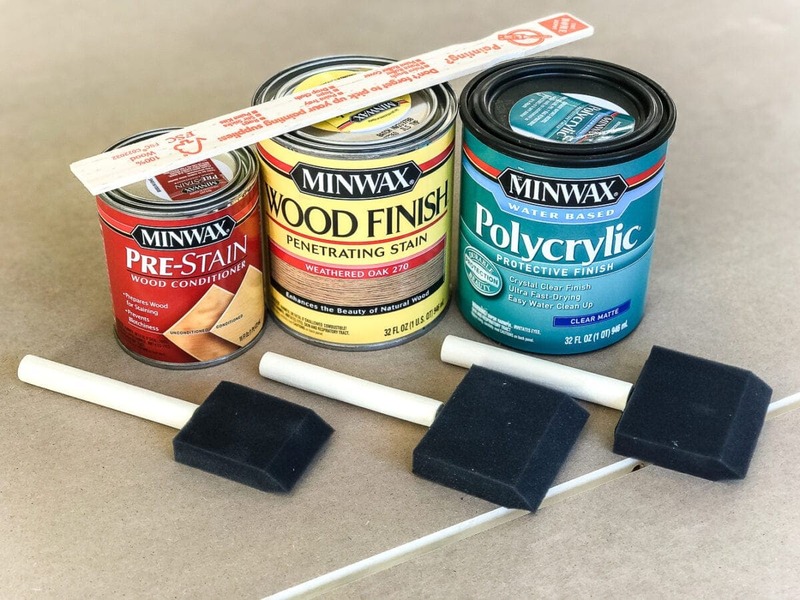 I just followed the instructions on the back of the can to apply the Minwax Weathered Wood Stain with another foam brush and rag, applying 3 coats. 6. Once the stain was fully dry the next day, I sealed the tabletop with 2 coats of the polycrylic. 7. For the base, I used a natural bristle brush to paint 2 coats of the Fusion Mineral Paint in Casement to get into all of the small grooves and details. 8. 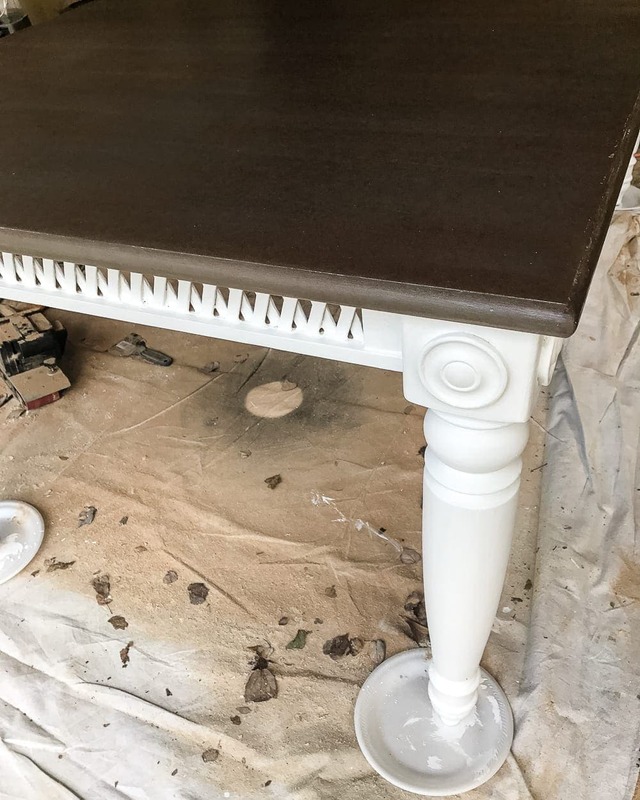 And to age the paint a little bit, I worked in sections (1 table leg at a time and 1 side at a time) and used a wax brush to apply the Homestead House Wax to work it into the small details. Then, I immediately wiped away the excess wax with a rag. It made all of the carved details stand out even more. So now our dining room actually looks like a real dining room! And the aging/weathering now looks intentional and pretty as opposed to just beaten up. 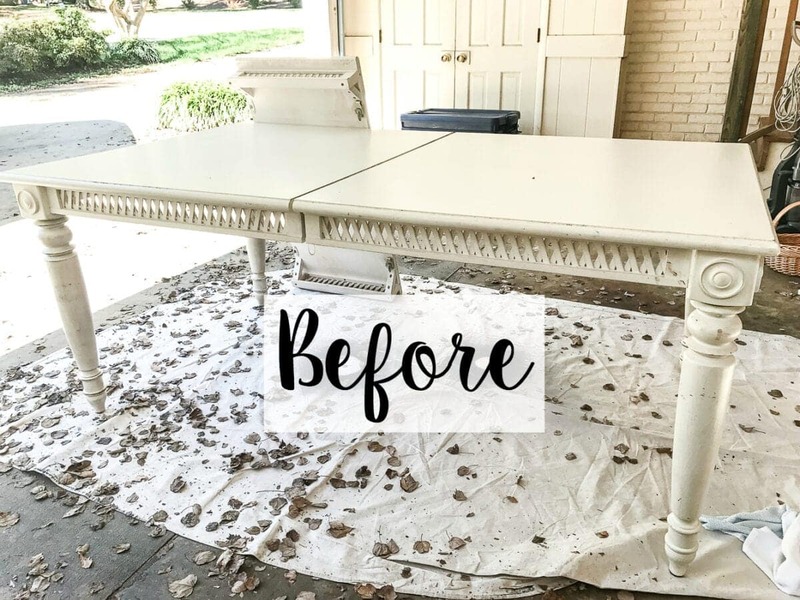 Even though I used pretty much the exact same process as our old dining room table makeover, the stain looks completely different on this one since it’s a different wood species. The two-tone look with the wood showing breaks up the white and charcoal so much better in here than an all white table would have. Since we’re getting this space ready to host some family dinners for Christmas next month, we’ve been in a hustle to get this room finished. So I snagged these Henriksdal slipcovered dining chairs during IKEA’s 20% off sale. They were the most kid-friendly yet still formal (and inexpensive) option for us because I can just toss these slipcovers in the wash if Olivia ever gets spaghetti hands all over them. They were even cheaper than most of the Craigslist dining chairs I found. I plan to get a pair of wicker dining armchairs for either end of the table too, but the ones I’ve had my sights set on have been out of stock for two weeks now. I’m still holding out though. I got this bleached jute rug at World Market on sale too to brighten up the charcoal on the walls. And I grabbed two sets of my favorite Ritva curtains since IKEA is the only place I ever have much luck with finding nice quality panels that are actually long enough to hang from ceiling to floor. 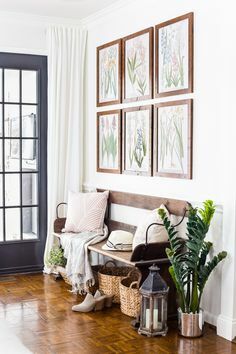 As for the rest of this room, I still have big plans for some wall decor and have been slowly collecting antique mirrors from thrift stores and eBay. More about that later though. So far this past week, we’ve dealt with a power outage from bad electrical wiring and our water heater has bitten the dust, so it’s just a bag of surprises here at the Shaver casa. Until all of those not-so-fun details are fully dealt with, this dining room might take longer than I originally thought. And with lots of cold, rainy weather the last few days, we’ve had to pause the exterior brick limewashing, but we’ll be kicking that back into high gear this week too. Just keep swimming, right? I’m so thankful for this house and this life every day even though nothing ever goes as planned. Never a dull moment around here. Wow. That’s an amazing find!! Just love how it turned out. Can’t wait to see your dinning room reveal. Lauren it is really gorgeous and worthy of that stately room. Those details on the table really make it a classy piece. This is looking great. The table is amazing. ARE YOU KIDDING ME RIGHT NOW? I can’t even! Beautiful. The fact that you saw that table and then saw it’s potential in your mind still blows me away. I looked at the “before” pic and that’s ALL I SAW. 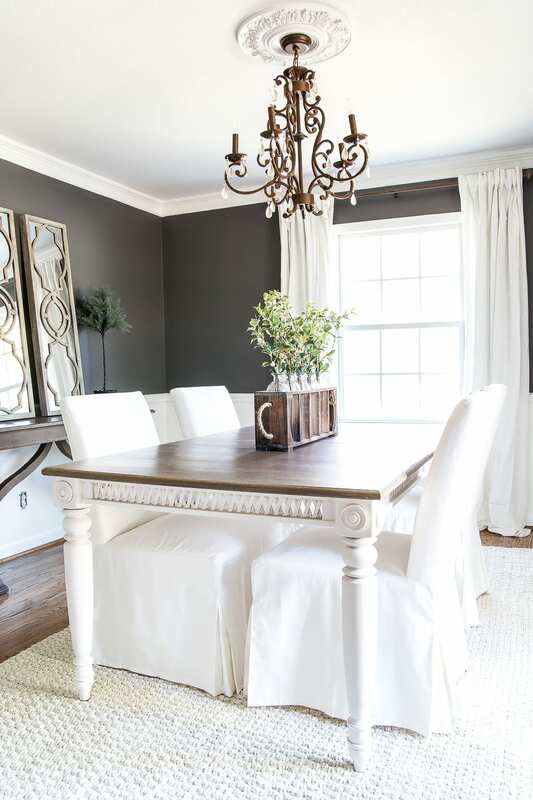 Then, to see it all pulled together in your dining room – it’s absolutely stunning. Love it. You went for it!! I was all fist pump, Sand it, sand it!! And you did. Looks so beautiful, Lauren! What are the dimensions of the rug and table? I’m having such a hard time trying to find the right sized table for my tiny dining room. Thank you! great job; i love the details on the side. You really scored on the table for $100! Beautiful! I love your home style. And I love a bargain. Good job. Lauren such a pretty, pretty table! The covered chairs make it look so elegant. Love it! Is this type of top coat safe to eat off? I’m not trying to be one of those trolls but I’m literally clueless when it comes to this. I’m assuming so since you just put it on your table, but we have babies that still eat straight off the table so I wanted to double check. Our table top has been through the wringer and needs a refresh. From what I’ve read, yes, polycrylic should be food safe once it has fully cured in 48 hours when the vapors are gone. 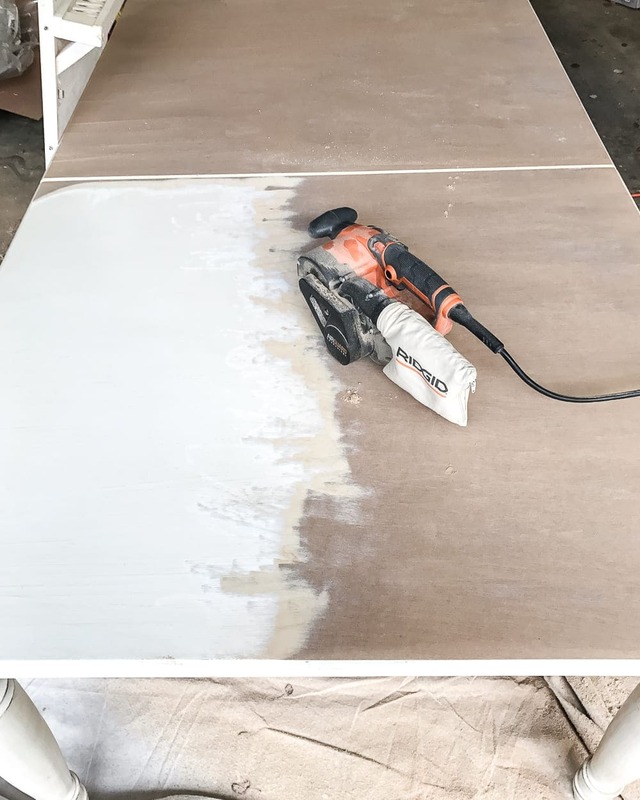 It’s a commonly used sealer for tabletops, especially. That was a lovely table to start with, but now it’s really beautiful. I am having serious table envy! That is gorgeous! ? Well done! It’s beautiful. I love how you made the details really show up. The table is stunning now, Lauren! You really gave it a brand new life. Your dining room is coming along beautifully too. I kept thinking how pretty the chandelier is in your photos! But I don’t doubt your vision for the room. Love this table, it turned out great! Did you keep your other dining chairs? The ones that you diy’d? Those were great. No, we decided to sell those since they were a little too farmhouse-y for this house. BRAVO!!!!!!!!!!!!!!!!!!!!!!!! 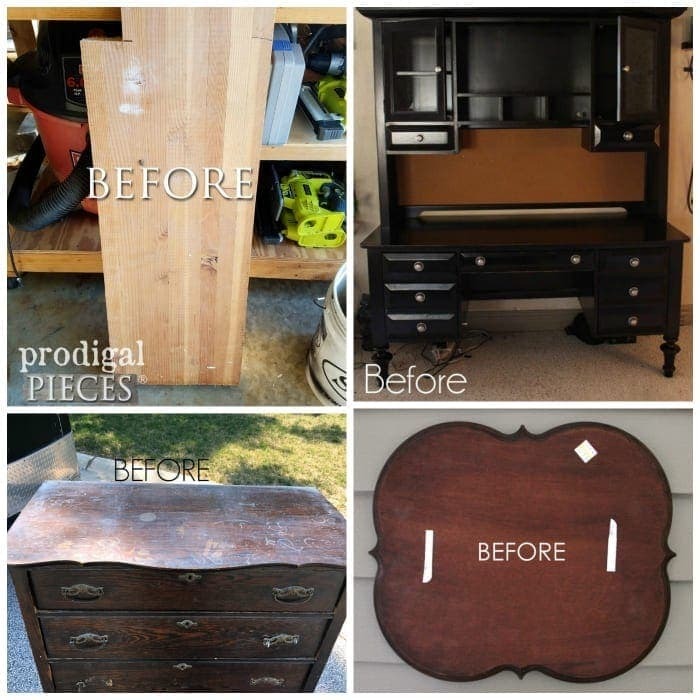 Oh my word you have done a remarkable job and made this unique treasure perfect again – it looks AWESOME in your gorgeous dining room. WELL DONE!!! ♥ it!!!! The table turned out very well! I am in love with the centerpiece on the table. Any info on it? Did you make it? Fabulous!!! Love that color, and chandy, and well everything! Looks so pretty. Where did you get your curtain rods? Wow. Beautiful job! 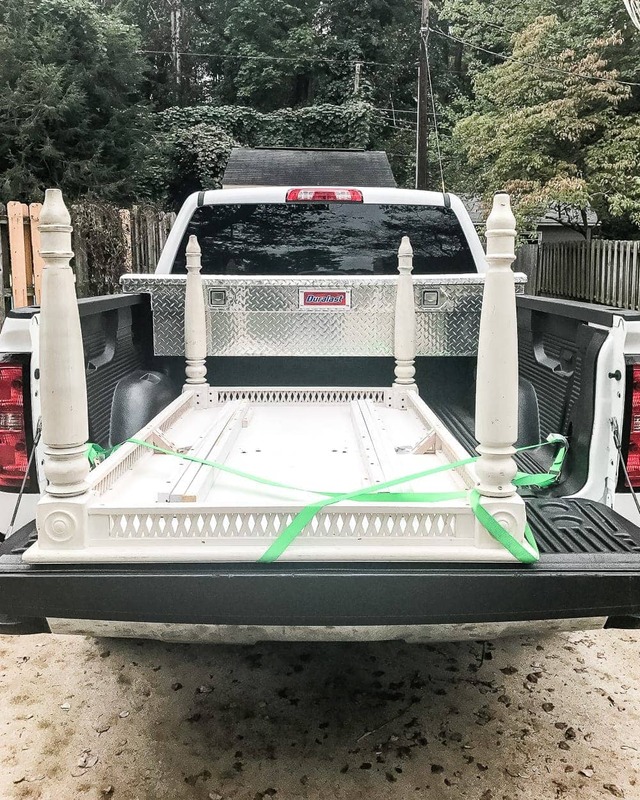 I loved it all white until the reveal – it looks SO good! Your dining room is beautiful. Good job!! So beautiful….and what a transformation!! It looks absolutely stunning in your new dining room!! Thanks for sharing….I’ve been seeing the “sneak peeks”, but it’s great to see the finished product! Blessings….and Happy Thanksgiving! Yes, keep swimming! Count it all joy 🙂 Looking really great in there! gorgeous table and details that you brought out with your technique! Nice find! I love your dining room table and especially the chandelier. All the pieces work well together. I can’t wait to see the other changes that you make. I love it! Is the greenery in the centerpiece just clippings from your yard or is it a more permanent faux product? Would also love to know what size rug you went with under your table. I’m going back and forth over here and I have had my eye on the exact same one, just waiting on a World Market sale/coupon. Love the dining chairs. I have the same ones, 8 of them. HELP, how do you get them looking so beautiful? Mine are a mess, wrinkled skirts, messy pleats. Yours are gorgeous! How did you do it? I have a handheld steamer I used on them when they were super wrinkly right out of the box, and I spray them with ScotchGard too to help repel any spills. I haven’t washed these yet, but the material is a lot like our sofa slipcover, and my trick for that is usually to put them slipcovers on while they’re still a little bit damp. That presses the wrinkles out some. Thank you so much for sharing! I love the table (and that beautiful woodwork underneath) and what you’ve done with it, but the chair covers make them look like ghosts! Also, if you have kids, I hope you have more than one of those cair covers, because you’ll want a “good” set for company, and a “not-so-good” set for other times. To each their own. 🙂 We probably will get another set of slipcovers just in case, but these are really easy to toss in the wash. We have a sofa slipcover in the exact same fabric.